Fashion, in its essence, is wearable art. Think about the clothes you’re wearing now: someone designed them, manufactured them, advertised them, and then you bought them and combined them into your own look! Here at CF, we’re big believers in this idea: from movies to books to music and more, our posts aim to prove that all creative mediums can inspire one’s clothing choices. Continuing our series on Fashion Inspired by Art, every two weeks, I’ll feature a piece of artwork and create various looks inspired by elements of the work. 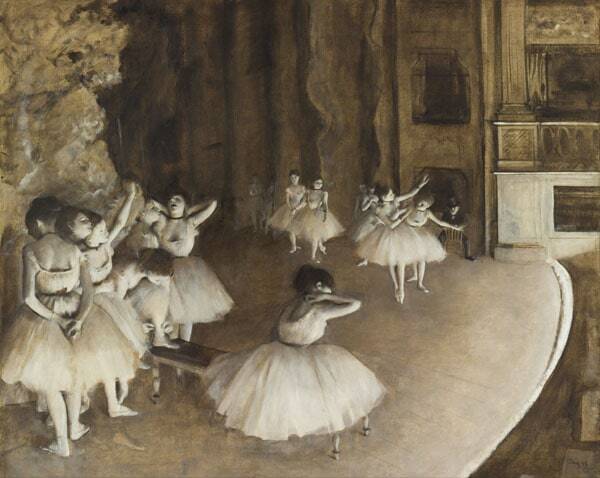 This week, we’ll be discussing Edgar Degas’Ballet Rehearsal on Stage. I hope you all enjoy! Edgar Degas (1834 – 1917) is considered to be among the founders of Impressionism, although he himself did not like the term. Known in part for his portrayals of dancers, Degas’ unique depictions of movement have been widely studied around the world. His style of painting is loose and soft, though precisely so – although his works appear to be spontaneous in their capture of movement, Degas actually spent countless hours observing the human form in motion. Ballet Rehearsal, while being one of Degas’ more muted works, does follow his typical sense of composition in that the background comprises much of the scene and great attention is given to perspective. In this work, Degas uses an overhead view to frame some of his favorite subjects — ballerinas. This gives the viewer a sense of looking down upon the scene, as if we are peeking into a dollhouse. This perspective, combined with the somber color palette and loose brushstrokes, creates an air of delicate, feminine features set against a dark, rigid background. Product Information: Dress – Delia’s, Earrings – Stella & Dot, Nail Polish – Essie, Cardigan – Fashion Union, Belt – Dorothy Perkins, Shoes – Payless, Tights – Charlotte Russe. Ballerinas are often seen as the epitome of poise, however Degas’ ballerinas are unique because they are shown at ease – this was actually quite unusual for the time. In keeping with the relaxed-ballerina motif, this outfit focuses on comfortable pieces that allow for movement. To get a look that’s ballet-inspired without being costumey, aim for a mix of ultra-feminine pieces (think lace, tulle, nipped-in shapes) and modern accessories (like a black patent belt and graphite stud earrings). A lacy dress becomes more casual when worn under a cozy cardigan, while beige patent flats are loosely ballet-inspired yet still classic enough for everyday wear. As always, this outfit is perfect for interpretation – add heavier layers if it’s a cold day, or substitute some boots for the flats. You’ll still maintain the ballerina look, especially if you style the outfit with a fashionable top-knot. In this girly Degas-inspired outfit, you’re sure to make an impression (ha!). Pants – Topshop, Earrings- Etsy, Shirt – Forever 21, Nail Decals – Etsy, Shoes – Boohoo, Ring- Forever 21. This look is based on the well-dressed man in the right background of the picture. 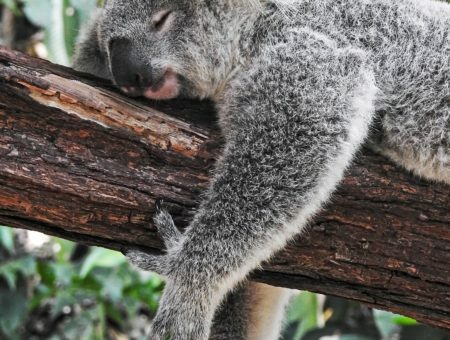 (Bet you didn’t even notice him the first time you looked — I didn’t!) He’s shown in his finest suit, which is what inspired this feminine take onmenswear. This outfit is all about the extras. 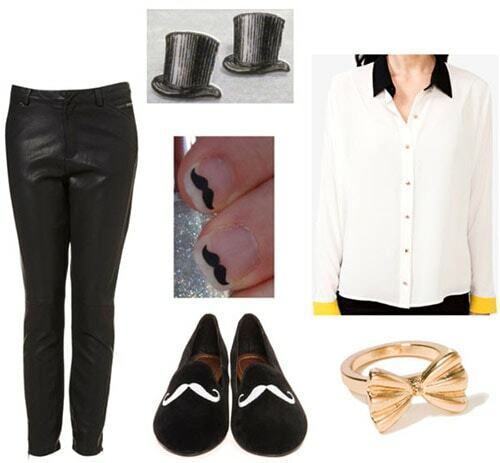 While tuxedo pants and a white button-down blouse are classic staples, fun details like yellow-cuffed sleeves and mustache-adorned flats add a lot of personality to the look. If you find that this outfit is still too masculine for you, glam it up with some bombshell waves, a lace cami, and of course a bright red lipstick! Just because you’re wearing clothing inspired by a man doesn’t mean you can’t look like a Hollywood screen siren. It’s totally up to you. Dress – Oasis, Ring – Urban Natures, Necklace – Etsy, Cardigan – Zalando, Shoes – DSW. In art, the setting is just as important as the subject. You wouldn’t wear a ball gown to yoga class, would you? This look is based on the objects in Ballet Rehearsal, which can be seen in the background. Behind the group of dancers on the left is a tree, and the right group stands in front of the curtain wings and hanging pictures. As stages are designed to be altered for each performance, this look is designed to be versatile in its usage as well. This outfit can be worn on many occasions, from class to a movie date. A loose, neutral dress imitates the flowing curtains, while ornate, bronze-hued jewelry recalls the set elements. Cap-toe ballet flats are a modern nod to the dancers’ footwear. Wear this look for any semi-casual event and you’ll feel like anything but a wallflower! Have you seen or studied a Degas work before? Do you enjoy his style of painting? What do you think about the inspired outfits? Which one is your favorite? Let me know in the comments below, I’d love to hear your opinions!